The full service music for the early-morning Mass of Christmas (Gregorian chant propers, sung prayers, and Renaissance polyphony), featuring the world premiere recording of William Rasar's Mass "Christe Jesu." The traditional Latin Mass provides a good structure for a recording because, in addition to its religious and theological significance, it is the supreme form of music drama. That the Mass is primarily a sung event is striking to any visitor: every text that is intended to be audible to the congregation is sung. Music has the practical effect of making the text more audible in a large stone church than when it is merely spoken. The musical backbone of Christian liturgical worship is plainchant. Even in the most elaborate musical establishments at the height of the Renaissance, the majority of the daily liturgical cycle of Mass and Divine Office was sung to the ancient plainchant formulas and melodies. Each text of the Mass is set differently according to its function, for musical setting has the ability to manipulate the speed with which a text is pronounced on a scale far beyond that of even the most affected speech. The prayers and lessons each have a distinctive recitational formula, but all present the text at a spoken pace. In contrast, the parts of the Mass sung by the choir, the proper chants that vary by feast and the ordinary chants that are sung at every Mass, are set at a slower pace: the text unfolds at a speed that would be unsustainably slow for spoken words. The most elaborate are the gradual and alleluia; the meditative musical punctuation between the two lessons. Each sets a psalm verse in a highly ornate manner that allows the singer and the listener to savor and contemplate the meaning in a different way from the longer scripture readings. The musical glory of the sung Mass in the last millennium is polyphony, in which many voices sing independently but combine in sweet concords: a further removal from the spoken delivery of the text in favor of its contemplative unfolding. By the fifteenth century, the principal polyphony at a Mass in England was heard in the settings of the Mass ordinary: the Gloria, Credo, Sanctus, Benedictus, and Agnus Dei (English Masses before the reformation almost never contained a Kyrie). 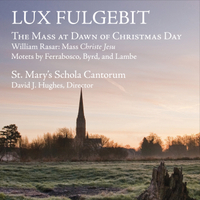 The centerpiece of this recording is the Mass Christe Jesu, composed on an unknown model by William Rasar, who was a clerk at King’s College Cambridge until about 1515. The Mass is the only extant piece known to be written by Rasar. It survives in two sets of partbooks. In preparation for our recording, we created a new edition based on the version in the Peterhouse partbooks. The tenor partbook is missing and had to be supplied from the Forrest-Heyther partbooks. Each section begins with the same musical material, which has the effect of tying the music together across the context of the intevening chant, an effect that is completely lost in concerts and recordings that present a whole Mass setting together. The Rasar Mass is unusual among English settings of the period in providing the complete text of the Credo. Most English and some continental composers omitted much of the final section about the belief in the Church. It is possible that this practice was used to avoid setting the contentious phrase “filioque” in the decades following the Council of Florence, but more likely it allowed the music to dwell more on the dramatic events in the central, Christ-centered section. Christe Jesu is also in duple mensuration throughout, which became the norm later in the sixteenth century; nearly all the other Mass settings in the two sources feature more elaborate mensural schemes. On this recording, we present the Rasar Mass in the context of a Christmas liturgy. Christmas, which commemorates the central event of the Incarnation, is alone among the feasts of the liturgical year in having three distinct and individual Masses: one at midnight, one at dawn, and one during the day. The first and third Masses are more widely known and recorded. Here the middle Mass at dawn is featured: the only one of the three that commemorates in its prayers the feast of St. Anastasia on 25 December. Several features of English sacred polyphony set it apart from contemporary continental music. The characteristic tonal language of Renaissance polyphony—the heavy reliance on the sweet, imperfect consonances ubiquitous by the late fifteenth century—appeared first in English music of the half-century before. But while trends on the continent led to Mass settings based on secular music or polyphonic models in the sixteenth century, England maintained its attachment to the old forms based primarily on plainchant. Even pieces without a chant model, like Walter Lambe’s Nesciens mater from the Eton Choirbook, have a distinctly English contour: the lines each seem to follow their own sinuous logic, with none of the pointed direction of later music. The result is tonally aimless, but exquisitely sonorous. The voices join in different combinations of two and three, while the full five voice texture is saved for a few climactic sections. Polyphony was widespread in England, with large musical establishments at the royal court, at many cathedral churches, and at many collegiate churches. Records show that even many simple parish churches had polyphonic singing on major feasts. Liturgy, and even sung liturgy, pervaded the lives of everyone in England at the turn of the sixteenth century in a way that is nearly impossible to imagine now. This was true even of economic and social life. Various guilds controlled English commerce and would hold regular Masses for the benefactors of the society. Indeed, it was a duty for all English people to have Masses said, or better sung, for deceased relatives and benefactors. The performance of chant and polyphonic music was one way to add to the dignity of this collective worship. When Henry VIII dissolved the monasteries and other religious foundations, much of this musical life disappeared as well. The process accelerated under Edward VI and was irrevocably confirmed in the Elizabethan religious establishment. In the destruction of church property, doubtless much music was lost forever, and even in the surviving sources there are gaps. As mentioned in connection with the Mass setting, the Peterhouse partbooks are missing the tenor. Fortunately the Rasar Mass has another source in the Forrest-Heyther partbooks, but many other pieces require reconstruction or recomposition of missing parts before they can be performed now. The Protestant reforms put an end to singing in Latin, except in a few small, academic corners of the country. More importantly, the new emphasis on singing in a way that would be intelligible to all put an end to the complex polyphony and the contemplatively slow unfolding of a word in a long chain of beautiful sonorities. The standard now was one note per syllable. This developed into the wonderful Anglican anthem style of the Elizabethan and Jacobean periods, but the unique style of Fayrfax, Taverner, and Sheppard became a dead end: the end of the long flowering of medieval culture in Britain. The motet style of Alfonso Ferrabosco the Elder, an Italian composer who served at the court of Elizabeth in the 1560s and 70s, can scarcely be distinguished from contemporary continental motet-writing, as in his Mirabile mysterium. These motets had no ritual purpose but would have been sung in private devotions by Catholics and Protestants alike. When all the ancient churches in the land became Protestant places of worship and the celebration of the old liturgy was forbidden, Catholic ritual and overtly Catholic music was forced underground. Some with Catholic sympathies conformed in varying decrees to the laws on uniformity of worship, while others recused themselves from attendance at Anglican services and faced fines or harsher penalties. In some areas, the local authorities were sympathetic and would look the other way as long as Masses were celebrated in private homes. Elsewhere, priests were captured and executed as traitors. Still, musical life within Catholic homes could be quite sophisticated. For example, Edward Paston, a recusant Catholic gentleman from Norfolk, left a large collection of music, often arranged for smaller groups such as one voice accompanied by a lute. This collection contains not only arrangements of pre-Reformation polyphony—Mass settings and votive antiphons—but also contemporary continental compositions by Lassus and Victoria and recently composed works by William Byrd. Byrd, the greatest composer England has ever produced, managed to keep his favored place at court and in the Chapel Royal in spite of his Catholicism. He composed works for the new Anglican liturgy, but also many that were intended for recusant Catholic use. He published three Masses and the Gradualia: a large two-part collection of liturgical polyphony for the Roman liturgy. Quem terra, pontus, æthera, an office hymn of the Blessed Virgin in Christmastide, is from this collection. This recording is not a reconstruction of an historical liturgy at which the Rasar Mass was first sung. The Sarum rite used in England at the time did not contain the Christmas Mass at dawn, and prior to the Reformation, men and women never sang together in church: boys provided the treble part. In the most important musical establishments there would have been several singers on each part. On the other hand, it is easy to imagine a small mixed ensemble like ours singing in a private Mass during the Elizabethan period. More importantly, this is a presentation of sixteenth-century liturgical music in a living context: the modern liturgy of the Roman Church in continuity with that of the sixteenth century, in which we sing every week at St. Mary’s Norwalk. The liturgical reforms of the mid-twentieth century, like those of Edward and Elizabeth, have nearly put an end to the Church's musical continuity with the past. The liturgy was greatly simplified, to invite the greater participation of the faithful, but in practice this meant discarding much music in Latin, including the plainchant that had been the backbone of the church’s liturgical prayer for over a millennium. This was unintentional, as many ecclesiastical documents have made clear: chant and sacred polyphony are treasures of the Church, quite apart from their obvious objective value as great achievements of human civilization. At small parishes like St. Mary’s Norwalk, the important work of keeping this music alive is happening: not preserving it as in a museum, but in the life of a community at prayer. Thanks to the support of the people of St. Mary’s, the Mass Christe Jesu has now been recorded for the first time.